Wanda Lee Earle, 78, of Sterling, passed away May 14, 2018 at Diversicare of Hutchinson. She was born February 8, 1940 in Sterling, Kansas, the daughter of Steven C. and Flossie Redford Elliott. She graduated from Sterling High School with the class of 1958, and from Cliff Mann Floral Institute in Denver, CO. Wanda has been a lifelong Sterling resident. She was owner of the former House of Flowers in Sterling, and was a receptionist for Continental Phone Company, Farmers State Bank and Birzer Funeral Home, all of Sterling. 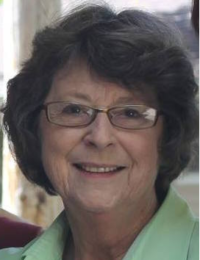 Wanda was a member of St. Mark’s Episcopal Church of Lyons and Beta Sigma Phi since 1970. On June 18, 1960, Wanda was united in marriage with Gale Howard Earle in Sterling, Kansas. He survives of the home. She is also survived by her daughter, Stephanie Schoenfeld of Katy, TX; son, David Earle and wife Sherry of Lindsborg, KS; sister, Susan Korsgren of Binghamton, NY; five grandchildren, Ashley Earle Brandes and husband Paul, Jonathan Earle, Austin and Jessica Earle, and Grayson and Saige Schoenfeld; three great grandchildren, Bevyn and Owen Brandes and Exum Earle. She was preceded in death by her parents. Funeral service will be 2:00 P.M., Tuesday, May 22, 2018, at Birzer Funeral Home, Sterling with Rev. Paul Brandes officiating. Burial will be at Sterling Community Cemetery. Memorials can be made to Sterling Public Library or Sterling College in care of Birzer Funeral Home, Sterling.